Status: offline Went through all rows and columns few times and still cannot figure out the next step. Any ideas? Status: offline Please include puzzle ID# and publish date. It is much easier to try to help with these puzzles if we can get the actual puzzle to play with instead of just a screenshot. EDIT: Nevermind. I didn't notice the puzzle number is in the title. I found the puzzle in the latest, Dec. 28th batch. Status: offline So no one solved it so far? I only managed to find 1x1 square at 22x34 but that doesn't really push me forward. 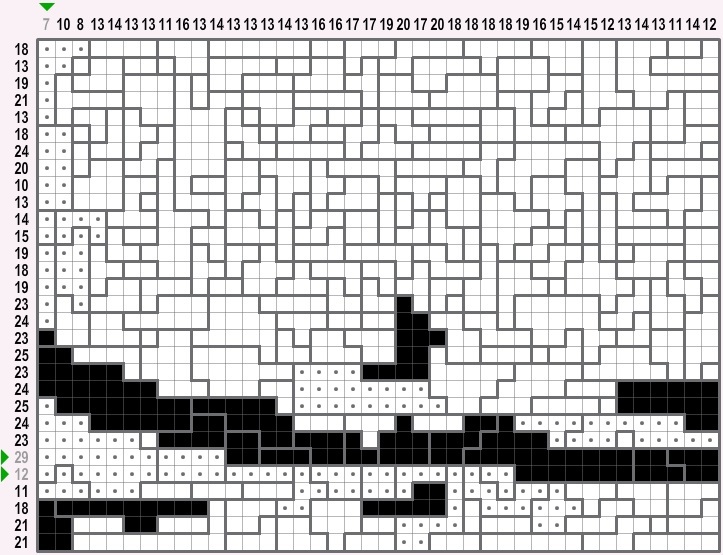 Status: offline In the bottom row you still need to fill 19 squares. The available blocks in this row are: 1,3,3,3,3,3,5,6,9. If you exclude the "1" there is no way to reach 19 so this square (and 6 additional squares in this area) must be filled. Status: offline You got further than me... Even with @dave's clue, I get stuck again. 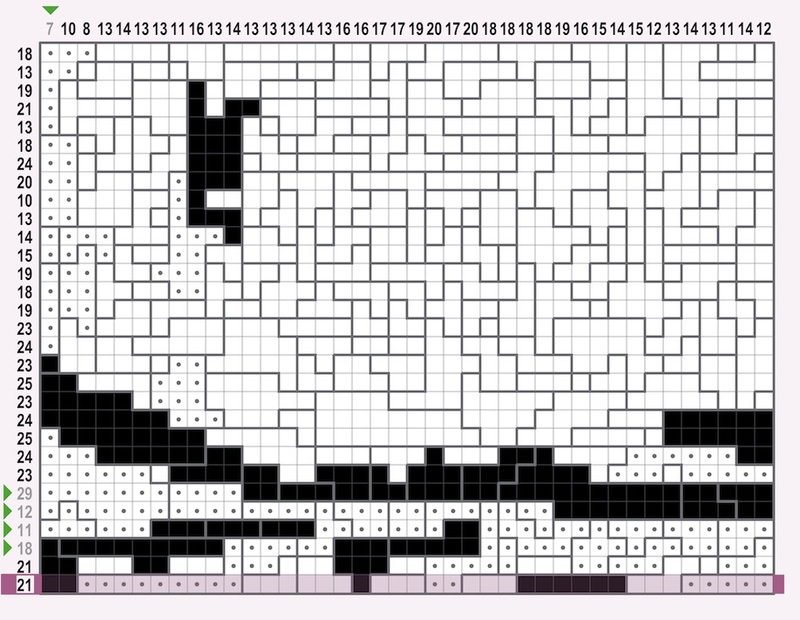 Can you explain how you ruled out the big blob at row 22 starting at column 16? Status: offline If you mark that block, then you have 23 of 25 in row 22 and 21 of 24 in row 21. There is no way to add the last 2 to row 22 and still be able to complete row 21. So no one solved it so far? Row 21. You need 11 more with 16 remaining. You only have 2, 3, 3, 4, 4 to work with. Both of the 4's must be filled and the 2 must be crossed out. EDIT: That is true based off of Mac-E's advances, not off your original posting. Status: offline Here is where I am at after applying everything everyone has pointed out and running through a quick check to find additional pieces. Status: offline It looks like row 19 (the 25) can be filled in completely. EDIT: Just as follow up info, I've now managed to complete the puzzle. There were a couple more spots requiring similar types of logic as we've seen so far, but nothing extreme. Mostly a bunch of hunting for the next place until the puzzle was complete.